INDE – Kappikunnu - A new prehistoric rock art site has been discovered at Kappikunnu near Pulppally in Wayanad district, the others being the Edakkal caves and Thovarimala, all in Kerala. The petroglyphs (rock engravings) bear a close resemblance to those on the walls of the Edakkal caves on Ambukuthy hills. 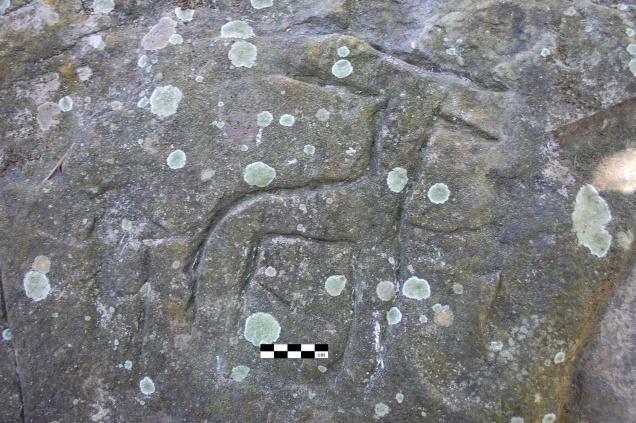 Four figures — one of two deer facing each other, and three abstract ones — have been found engraved on a huge chunk of rock. Other lines on a smaller rock that could have dislodged itself from the main rock, resemble a headgear. The rocks were found in the precincts of the Sree Veliyambam Kotta Siva temple, an apsidal temple (semicircular or polygonal in shape) believed to have been built in the 12th century AD, inside the South Wayanad Forest Division. The petroglyphs probably date back to the Neolithic period, Gira Gratier, a scholar from Belgium, told The Hindu. Ms. Gratier, who was here as a part of her research project on the tribesmen of South India, visited the site after she was told of it by the local people. The site might be a ‘cosmic area’ where ancient people performed rites, she said. The rock engravings might have been part of a huge structure in the past, she said. A recent exploration by the State Archaeology Department yielded a Neolithic celt from the area, K. Krishnaraj, Archaeology Department’s Officer in-charge of the Edakkal Caves, said. The style of depiction of the anthropomorphic figure and some other figures at Edakkal resemble the figures at the new site, he said. He also said that a stone inscription from the 9-10 century AD related to the Jain faith was discovered from the area some years ago. FRANCE – Montceau les Mines - Depuis ce lundi matin, le site du futur boulodrome de Salengro fait l'objet d'un diagnostic archéologique mené par l'Institut National de Recherches archéologiques préventives (INRAP, basé à Dijon). Cette étape a été rendue nécessaire avant le lancement des travaux du boulodrome. La suspicion de présence de vestiges gallo-romains mis à jours en 1956 montrant l’existence d’une villa (tubulis pour hypocauste), lors de la construction du bâtiment actuel (centre sportif de Salengro) est à l’origine de ce diagnostic qui durera au maximum jusqu'à jeudi. Marie-Noëlle Pascal, archéologue et responsable de l'opération, doit rendre son rapport faisant état des découvertes réalisées à la DRAC qui a autorité pour lancer des fouilles archéologiques si elles sont nécessaires. ROYAUME UNI - St Helens - Offenders who are serving community payback orders have been signed up for a local Time Team-style archaeological dig. 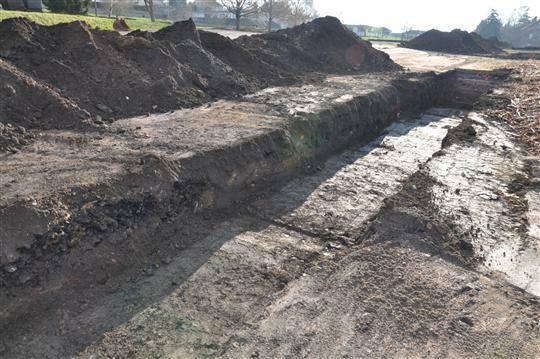 They have been helping out with efforts to unearth more information about the historic Stanley Copper Works. Located at Stanley Bank, the copper works is believed to have been established by Thomas Patten in 1772, and at its peak was producing roughly 30 tons per week. Past efforts to locate the site of the copper works have been unsuccessful and no physical remains have been recovered. 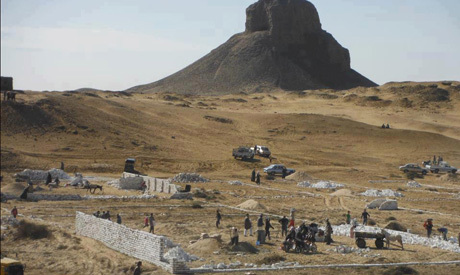 EGYPTE – Dachour - A lack of security continues to negatively impact on Egypt’s archaeological sites. A few months ago, Ezbet Kheralla, in Old Cairo, home of early Islamic monuments, was subject to damage by neighbouring residents. Today is the turn of Dahshur. Inhabitants of Ezbet Dahshur invaded the archaeological zone adjacent to the Black Pyramid of King Amenemhat III with bulldozers and guns. They put their hands on the land and start digging a private cemetery on top of artefacts buried in sand. The area was a cemetery for ancient Egyptian nobles; a German excavation mission unearthed several funerary objects there. Dahshur is a royal necropolis located in the desert on the west bank of the Nile almost 40 kilometres south of Cairo. It is known for its several pyramids, two of which belong to King Senefru, the founder of the 4th Dynasty and father of King Khufu, along with other pyramids and tombs of the Middle Kingdom, including the Black Pyramid of Amenemhat III and the White Pyramid of Amenemhat II. 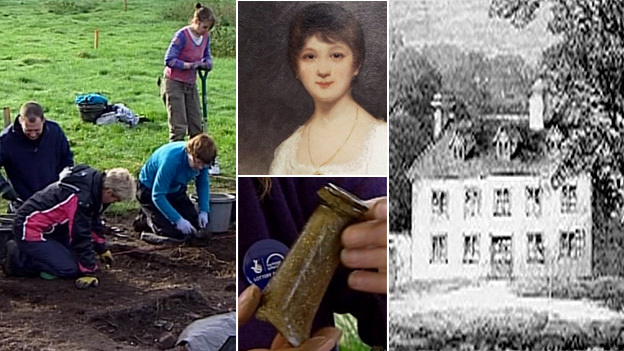 ROYAUME UNI – Steventon - Finds from an archaeological dig at the birthplace of Jane Austen are beginning to reveal details of the author's early home life. Volunteers excavated the field in Steventon in the Hampshire countryside in 2011 where the village's old rectory once stood. The process of cleaning and interpreting the finds has yielded a clearer idea of what the house looked like and even what the family ate their meals off. Austen was born in the village where her father was rector in 1775, and lived there for 25 years. It was there she drafted stories which were eventually published as Pride and Prejudice and Sense and Sensibility. The house was demolished soon after her family moved to Bath. The land returned to meadow but was never ploughed, raising the prospect of a successful dig for any remains or household artefacts. Contemporary records and an initial geophysical scan of the ground was used to identify the exact position of the house. No visible signs of the building remained, aside from a blocked-off well. 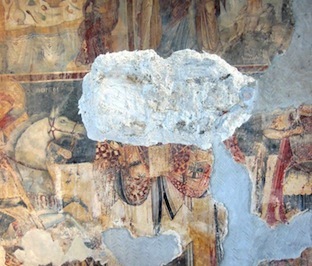 ALBANIE – Elbasan - The violent removal by primitive means of wall paintings dating back to 1554, made by the famous iconographer Onoufrios, from the orthodox church of Aghia Paraskevi in Gjinari of Elbasan, caused a series of various reactions. 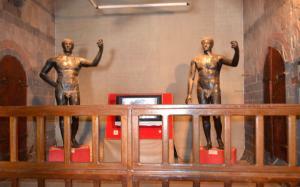 The vandalism acts took place on December 30, 2012 and on January 4, 2013. 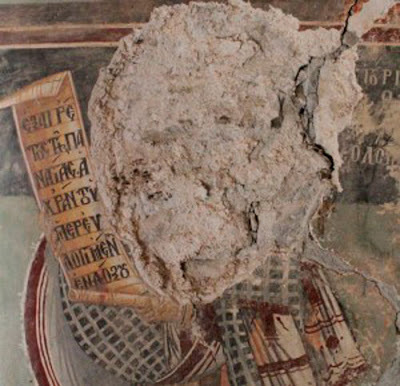 Despite the fact that police were immediately informed after the first theft, when the heads of five saints were removed, no measures were taken. The robbers came back and removed other parts of the icons. YEMEN – - Yemen has long been noted for its unique history. Proof of this is the numerous historic relics found in museums and archaeological sites that piece together the country’s rich cultural heritage. However, questions are now being posed regarding how serious concerned authorities are about protecting the country’s antiques against saboteurs and merchants looking to earn a quick buck by smuggling and selling the historic valuables. Yemen's unstable security and economic situation over the past two years has led to an increase in the black market for antique relics said Mohammed Al-Sanabani, the head of the Antiquities General Authority.